Earlier this month, Audi unveiled the smallest SUV, the Q2 at the 2016 Geneva Motor Show. The Q2 looks similar to the other Audi SUVs but has its distinct elements that might work with a younger audience. 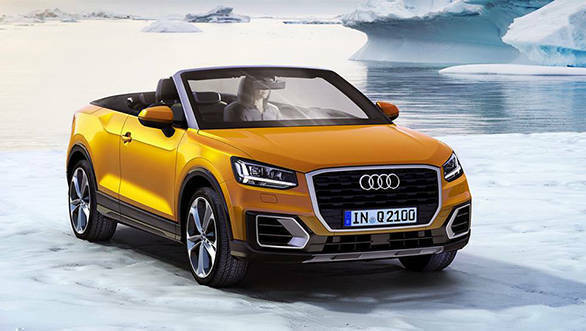 However, there is a new rendering that has surfaced online that outlines a convertible model based on the Q2 SUV. The rendered image carries the same front as the Q2 but receives a major change in the form of a chopped roof and two doors instead of the four. If Audi considers making the Q2 convertible for real, it will be the first convertible SUV from the German carmaker. The rendering might appear outlandish to some but is surely not impossible to execute as Volkswagen revealed the T-Cross Breeze concept at the Geneva Motor Show. Both, the Q2 and the T-Cross Breeze are based on the MQB platform, making it a viable option. The powertrain options in the Audi Q2 include a 1.0-litre three-cylinder motor that puts out 114PS and is mated to a 6-speed manual transmission with front wheel drive as standard. Higher variants feature Quattro and 7-speed dual clutch transmission. The highest spec variant will come equipped with a 2.0-litre turbocharged petrol motor that generates 190PS of power. The same might be carried forward to the convertible SUV.